Based off Joseph Simmons design, A1-PWR Loader with a few modifications. 1: Hand Cannon, Arm Shield, Dual Searchlights. 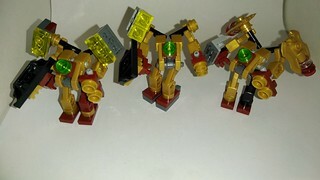 2: Hand Cannon, Arm Shield, Searchlight, Foot Stabilizers. 3: Hand Cannon, Armored Knuckles, Shoulder Thrusters.